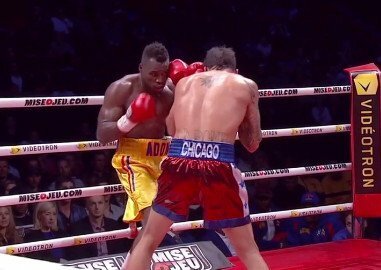 By Joseph Herron – After becoming the mandatory IBF title challenger by knocking out Super Middleweight contender Don “Da Bomb” George on October 12th at the Bell Centre in Montreal, Quebec, Canada, Adonis “Superman” Stevenson (19-1, 16 KOs) is ready to take on the best at 168 according the his friend and trainer Javan “Sugar” Hill. Although Stevenson is the next in line to face the current IBF Super Middleweight Champion Carl “The Cobra” Froch, the talented young trainer claims that Adonis is willing to fight any of the major title holders in the packed 168 pound division. But despite achieving the distinction of being the next in line to face the current IBF Champ, it seems that Adonis will have to wait until the muddled IBF championship picture develops before he can get his opportunity to face the eventual title holder. This weekend, former IBF Champion Lucian Bute will face the imposing menace from Russia, Denis Grachev, who shocked the boxing world earlier this year by knocking out highly touted Super Middleweight prospect Ismail Sillakh on ESPN’s “Friday Night Fights”. Also, current IBF Champion Carl “The Cobra” Froch will make his first voluntary title defense against Yusaf Mack at the Capital FM Arena in Nottingham, England on November 17th. If both Bute and Froch are successful in defeating their respective opponents, the two top rated Super Middleweights have plans to step in the ring once again during the first quarter of 2013. An eventual rematch between Lucian Bute and Carl Froch was factored in as a stipulation of their initial fight contract, which was negotiated back in March. Even though most fight fans and boxing scribes feel that a second meeting isn’t merited, due to one sided nature of their first bout on May 26th, the two fighters are contractually obligated to fulfill their plans of fighting once more in Bute’s adopted hometown of Montreal, Canada. While there’s no guarantee the IBF will honor the pre-negotiated arrangement between Froch and Bute, the former Detroit Police Officer turned fight trainer surprisingly hopes that the IBF respects the two fighters’ request. Even at the accelerated age of 35 years old, Sugar Hill claims that Adonis Stevenson has plenty of time to reign supreme over the packed Super Middleweight division. Previous boxing news: Interesting Match-Ups Await “Dr. Steel Hammer” – are Wach, Povetkin, Boytsov/Fury soon to give Wladimir a real fight?